One in five asylum seekers in the EU are from Syria. 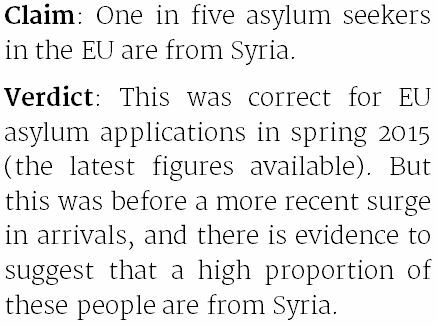 This was correct for the EU asylum applications in spring 2015 (the latest figures available). But this was before a more recent surge in arrivals, and there is evidence to suggest that a high proportion of these people are from Syria. "Only one in every five migrants claiming asylum in Europe is from Syria"
"Claim that Syrians make up 'only' one in every five asylum seekers arriving in Europe is flawed"
The Daily Mail's claim that only one in five of those seeking asylum in the EU recently are Syrian rests on analysis of figures from the EU statistics agency, Eurostat. The claim is correct for the period it covers, but the Guardian is on solid ground in saying that there could be a high proportion of Syrians among more recent arrivals, who aren't in the Eurostat figures. The Mail looked at the number of new asylum seekers in April, May and June this year. It's correct that of these 213,000 people, 44,000 (21%, or roughly one in five) were recorded as being Syrian. The Guardian, though, points out that three months is a long time in refugee crises. It says that there has been a surge in people arriving in Europe since the period covered by the Mail's figures, and that more of the recent arrivals will have been Syrian. The Guardian points to data from the International Organisation for Migration (IOM). This estimates the number of "irregular maritime arrivals" across the Mediterranean so far this year, 99% of which land in Greece and Italy. By 17 June, it said there had been around 54,000 in Greece and 59,000 in Italy. By 17 September, the number arriving in Italy had more than doubled, as 63,000 arrived in three months, but for Greece that figure swelled by almost 300,000—nearly five and a half times as many people as were recorded in January-June. The IOM says just under 40% of the total number of arrivals to Europe by sea in 2015 have come from Syria. More of those arriving in Greece, which has recorded the biggest rise, are thought to be Syrian. A third source, the United Nations refugee agency (UNHCR), has almost identical figures for Mediterranean sea arrivals, which it tells us come directly from the authorities in Greece and Italy. It thinks that over half of them are Syrian. The difference between this estimate and the IOM's may be because the UNHCR updates its figures more regularly, but we're still trying to work this out. These are just the people recording arriving in the EU, not those who have applied for refugee status, still less been granted it. But it could mean that when they make it into the Eurostat asylum application figures, the proportion of Syrian asylum applicants will be higher than 20%. We can test this to some extent by looking at the Eurostat numbers for Germany, which are published ahead of most EU countries. In April to June, 20% of new asylum applicants there were Syrian, in line with the EU as a whole. That rose to 28% in July and August, which seems to support the Guardian's argument. Even this isn't definitive, as the German government says there is a "significant delay" between when a migrant physically arrives in the country and the filing of an asylum application. Some of those arriving in July and August are yet to show up in the application figures for those months. So what source should we be using? They each have their benefits. The Eurostat figures—which we've used in previous articles—are helpful as they give us precise numbers of asylum seekers and refugees, as opposed to all migrants. But it's important to make clear when using them now that they don't cover the recent surge in arrivals, many of which will enter the asylum system. The IOM's and UNHCR's estimates are a lot more up to date, which is helpful in a fast-moving situation like this one. They look only at people arriving in the EU and can't tell us whether or not they will or should be granted refugee status. The IOM told us that its figures are based on self-reported nationality, so there's a risk that some people saying they're Syrian at this point are not, but it's "impossible to know" how significant an issue this is. Why does it matter where people come from anyway? The UNHRC also told us that the vast majority of non-Syrian migrants arriving in the Mediterranean come from dangerous countries too, cautioning against any assumption that Syrians have a monopoly on valid asylum claims. The Guardian makes a similar point. It's true that each asylum claim needs to be judged on its own merits. That said, 95% of decisions made on asylum applications to EU countries by Syrians last year were positive, even before appeal—only 5% were rejected. By contrast, 98% of Serbians, 92% of Albanians, 37% of Afghans and 11% of Eritreans were turned away. Being a migrant from Syria is a good indication that someone will ultimately be deemed a refugee from Syria, which isn't the case with all other countries. How many asylum seekers has Britain had? How many Syrian refugees are there in the UK? Asylum in the EU - easy or not?